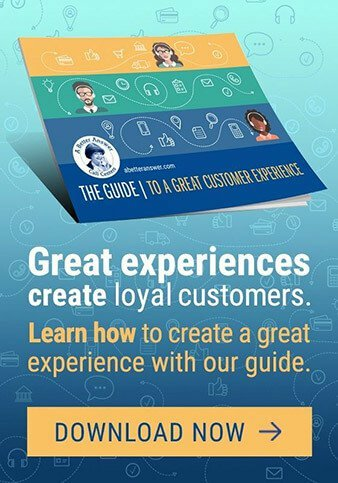 No matter the industry you are in, a great customer experience is vital to the success of your small business. There are enough challenges when growing a business without adding poor customer service to the mix. These are five big reasons why customer service is so important to small businesses, and what it means to the future of your company. Customers that feel they can come to your company and have a great experience are more likely to keep coming back. You can build trust with them by always offering a consistent experience. The kicker is that building that trust takes time, but it can only take one instance to lose it. With enough great service, you can build some goodwill in case a mistake happens. Apple has spent years building up their reputation for fantastic service. They could make a mistake in one of their stores once, and you might be able to write it off. Imagine a company that has provided consistently poor customer service — they have an insurmountable task to rebuild trust. Focus on starting with great customer service; the rewards are well worth the time and resource investment. While customer service has always been a huge factor for the competitiveness of businesses, it’s become even more crucial since the 2008 recession. Companies that didn’t adapt and offer customers a great experience struggled, while those that went above and beyond (while still being smart about their profitability), were able to make it through the tough financial times and come out ahead. You can see a live example of this in as odd a place as the American version of The Office. Dunder Mifflin was a struggling archaic idea of a company when the show started. They were a paper company in a paperless world. As the years moved on, and customer service DID become a significant differentiator, they began to bounce back due to their hands-on and personable approach. This is an excellent pop culture representation of customer service becoming a more influential differentiator for businesses and has the potential of ensuring your business stays afloat if your industry suddenly finds itself shrinking. Great service helps you stand out from the myriad of competitors. By being the company to offer exceptional service, customers will start seeking you out. This can be very important if your market becomes oversaturated. Being the company that offers the same great products and services with the added benefit of customer service can help when you end up against too many competitors. Small businesses and tight budgets go hand-in-hand. Referrals from customers that are evangelists help small companies continue to grow, even when their sales team is at its bandwidth, and the marketing budget is spent. Referral business is low cost to companies and can have a very successful close rate. Frequently referrals enter your sales pipeline with higher trust. In a recent Nielson survey, they found that 83% of people trust recommendations for products and services from people they know. Social media is spreading the word of favorable product recommendations faster than ever, and Facebook even has a special post style to ask for recommendations. Your customer service becomes a catalyst for creating happy clients that are willing to recommend your company to their friends and colleagues. Upselling customers is a vital part of growing a small business, in part because the cost of acquiring new customers is far higher than retaining them. This means that if you have products and services that can be expanded upon, you should be focusing some of your sales on your existing customers. Closing a sale that has been poisoned by a bad customer experience can be near impossible, though. Customer service directly supports your sales team. If existing customers can’t get the right information on a call, or feel they are not important, they’ll move on to a competitor before long. Upselling customers increases your profitability and allows you to focus more of your budget and resources to expand your business. A culture of customer service starts with leadership and can have a direct impact on the happiness of your employees. If your customer service isn’t valued and leads to frustrated clients, your team has to deal with the fallout. A culture of customer service can show your team that you care about them and your customers. It leads to more pleasant engagements and creates an empowered team who feel they can go above and beyond for their customers. This directly impacts the growth of the company. In fact, companies that are growing are 21% more likely to emphasize customer service. Customer service in a small company has a more substantial impact than at a big company. The specialists giving your customers a great experience can share their triumphs readily, and you can see and feel the successes. This gives you a big customer service advantage and is why customer experience should be top of mind for small businesses.